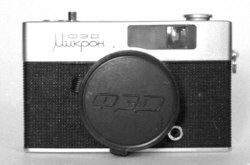 The FED Micron is a semi automatic half-frame camera, meaning that it takes standard 135, 35mm film but only uses half the frame. Well, of course a half-frame still camera negative is actually the size of a full motion picture frame. The film in a motion picture camera is rolling from top to bottom or vice-versa whereas the film in a still picture camera is moving left-to-right so with most half frame cameras, where the film is also moving horizontally, the orientation is by default portrait. It is very funny when look through the view finder for the first time and seeing the portrait format blended in instead of the usual landscape view. Semi automatic in the Mikron camera series means here that the camera measures the light using the cells located around the lens and setting the shutter speed accordingly. The only thing the photographer may change is the aperture to control depth of field and of course the focussing distance, no autofocus here. Setting the film speed is done by turning the wheel at the back of the camera, scale is in GOST (spelled something like 'roct' in Cyrillic letters) but the values are easy to convert to now standard ISO values. A GOST is about 10% less than ISO, making GOST 45 about equal to ISO 50, GOST 90 equals ISO 100, GOST 180 is ISO 200 and so on. After the highest film speed setting a dash '-' shows up, would this mean that the exposure meter is not setting the shutter speed, meaning the shutter speed is constant? Maybe it's time to try and find out. Unfortately the exposure meter on my camera is often off or might be broken, suffering from a bad contact or just used up?  The result is that the speed setting appears to be at a constant value. Mine seems to be stuck at 1/60, which is also more or less the flash speed but well, as I don't hae a calibrated meter, it might also be the advertised 1/30, it's hard to say. There is a needle on the right hand side in the view finder but mine is stuck, it does move a little when pressing the shutter half way but not into the number field, maybe yours might work better. Loading film is easy, open the back by pressing the button on the top plate on the left hand side and the entire back falls off. This also means that opening the back by accident is equally easy, a major design flaw in my opinion. So be careful, maybe a good idea to put some tape over it when a film is loaded. Looking through the view finder you can see some little icons on the left. One person, a group of people, a landscape and so on. This will help you set the distance scale without looking on the lens itself. A pretty nifty feature but it should not make you stop thinking about what you're doing, point and shoot would usually work but alas, not always. I like the look through the viewfinder anyway, very bright and with a friendly colour. When rewinding the film, don't forget to unlock the take up spool first by pressing the little button on the bottom of the camera. It's a little fiddly but works fine and the mechanism is simple, minimizing the chance of a break down. Manufactured : 1968 - 1986 at the Dserschinski Maschine Werke, Charkow, Russia. Accessories : This camera came in a small soft, black, vinyl bag which looks very 60s. Cult! The name sais it all - the resource for Collectors. 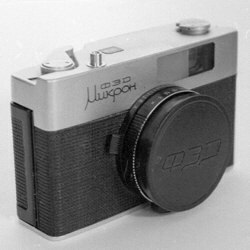 Descriptions and pictures of many Russian cameras, including the FED Micron. 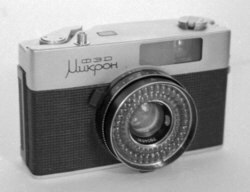 The Sub Cub is the meeting point for users and collectors of subminiature cameras.